Kirsten Benfield was born in 1965 in Auckland, New Zealand. When she was four years old her parents embarked on a three year global overland journey. Kirsten's strongest memories of the trip were the many colors she saw in the various countries that they visited. When she returned to Auckland she began to observe and communicate through art. Photography was an early passion that taught her about focus and composition. At the age of 26, Kirsten moved to New York, and moved to the Hamptons.. She found the north east and the seasonal changes very inspiring. She was particularly attracted to the ocean and bays. She got a job in a local restaurant and settled into working, and in her spare time observed the regional woods and waterways. She enrolled in watercolor classes at Guild Hall with Miriam Dugenis, and took her camera everywhere. She began to develop her own path of creativity. She hosted several solo studio shows in the early 2000's. In 2012 at the suggestion of a local artist, Kirsten started taking classes at The Golden Eagle, a local art supplies store that hosted art classes. Kirsten attended weekly art classes in oil and watercolor. The first year she studied with Janet Jennings and Barbara Thomas. She also took plain air classes with Barbara Thomas through Parrish Art Museum. In 2015 Kirsten attended an Eastern/ Western inspired Calligraphy Workshop hosted by Kazuaki Tanahashi and Monica Dengo in Venice, Italy. This experience has firmly left an impression on Kirsten's work. Recently Kirsten moved to Springs in East Hampton. 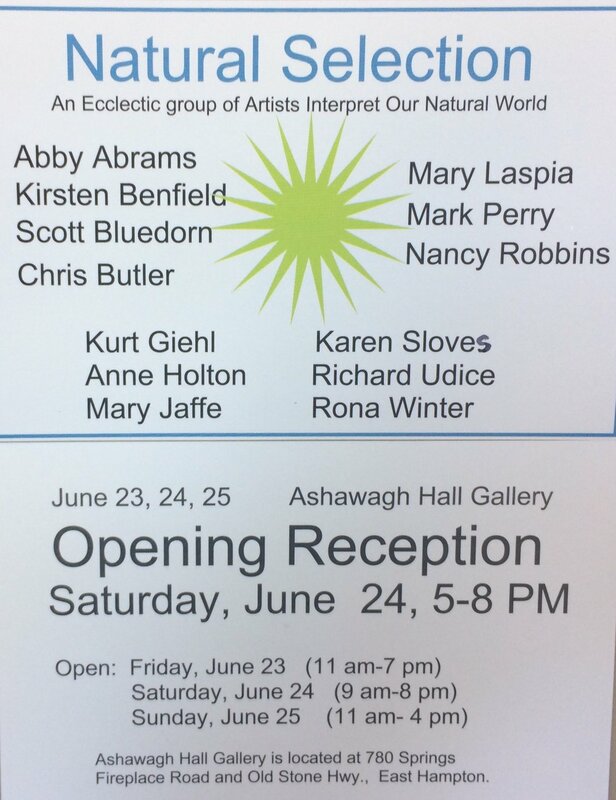 Her work is shown locally. 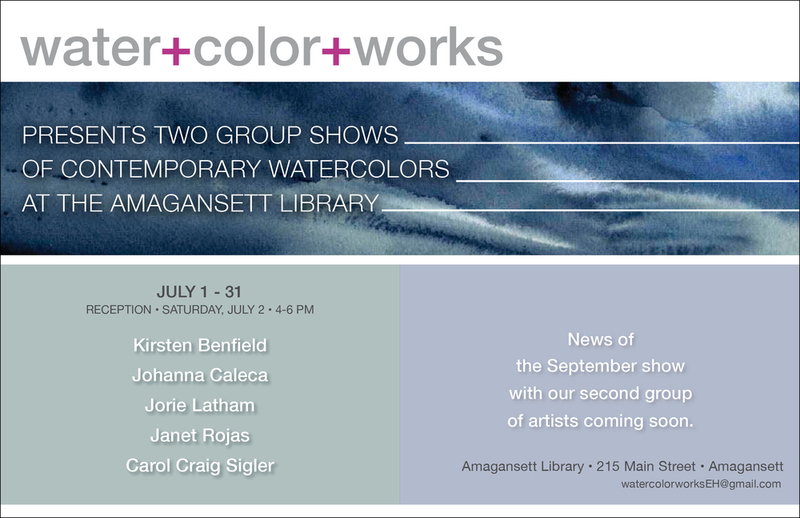 She works primarily in oil, water colors and, occasionally, printmaking. Her work includes landscapes, abstracts and transfers. The subjects include figures, wild life, sea life and still life. 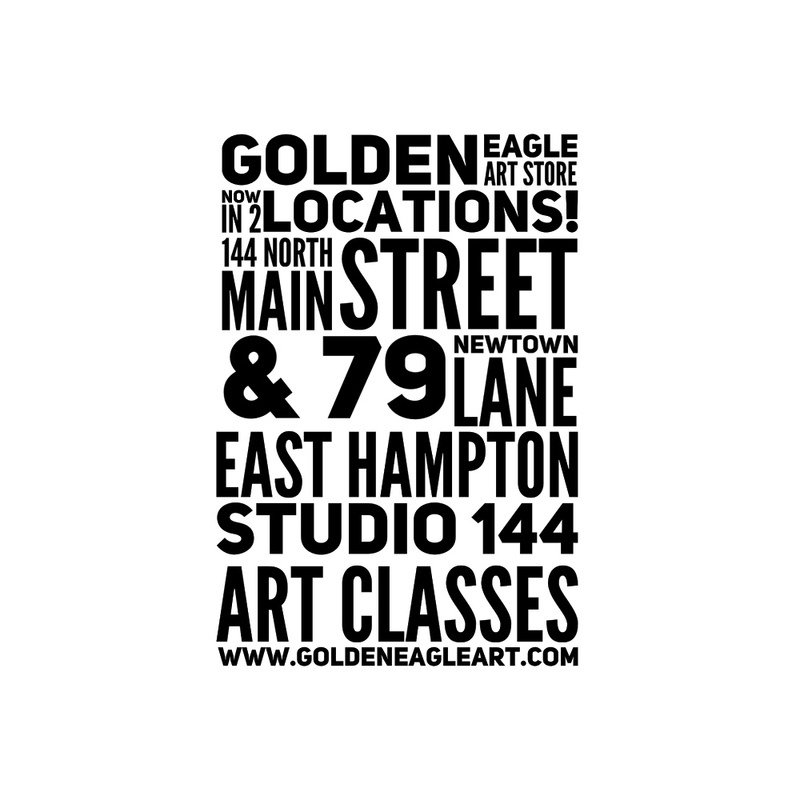 In 2017 Kirsten started part time teaching adult beginner Oil and Watercolor classes and the Golden Eagle- Studio 144. Kirsten Benfield’s grandparents inherited a travelogue from an unknown relative when she was a little girl. The diary was filled with thoughts and watercolors recorded when her family members traveled from England to New Zealand. “It inspired me,” she said sitting at her desk in her Springs cottage. The travelogue has since disappeared but the memory of it still lingers in her mind and motivates her work. She grew up on the North Island of New Zealand in Auckland. “When I was 5, my parents took me overland, all over the world,” she said. The family traveled “hippie-style,” across Australia, Malaysia, India, Iran and Afghanistan. Traveling took her away from family and friends, but the colors and smells of each exotic land remain with her today. Along the way, however, she and her mother picked up typhoid fever. By the time they reached England, her parents split up and she and her mother headed back to New Zealand. She left school at 16 to model, work in restaurants and study culinary arts and hospitality. She lived in Australia for a year and traveled to Europe, where she discovered the old masters. In the meantime, her father, an architect, visited New York and fell in love with Sag Harbor. “It was his favorite town,” she said. At 26, she followed in her father’s footsteps and traveled to New York City with her best friend, who secured a modeling contract with an agency, as well as her friend’s husband and their child. Within a year, they all moved to Southampton together. She lives alone now but she’s not alone. She’s been part of the Nick and Toni’s restaurant family since 1996. “It was the first film festival, the diner,” she said of the time when Nick and Toni’s owner Jeff Salaway started the Hamptons International Film Festival and the company was running the Honest Diner in Amagansett. Mr. Salaway tragically passed away two weeks before September 11, 2001. “Jeff was just the light,” she said. Ms. Benfield and Bonnie Munshin, along with co-owner Mark Smith and chef Joseph Realmuto, became the team that kept the classic East Hampton restaurant going through the years. When Ms. Munshin decided it was time to step back, and a new management team stepped in, Ms. Benfield had more time on her hands to pursue her artistic dreams. “I’m more of an ambassador now,” she said. Less responsibility at the restaurant meant more time to expand her horizons. That’s when a coworker suggested teaching watercolor painting at the new Golden Eagle Artist Supply next door to the restaurant on Three Mile Harbor Road. It was also one of the first places, besides Guild Hall in East Hampton, where she took classes, over a decade earlier. So she is coming full circle. 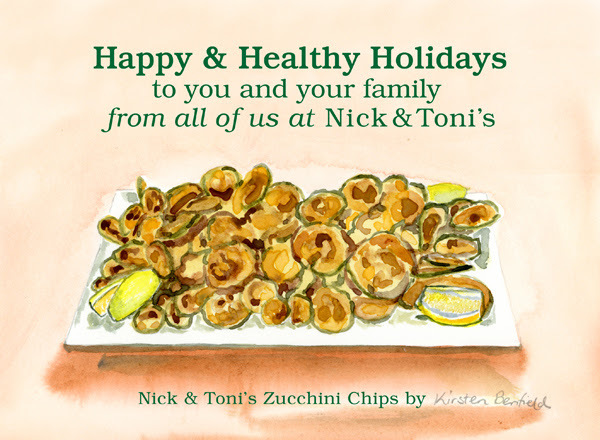 Her interest in art picked up when she married Paul LaBue, a chef at Nick and Toni’s. “Paul bought me a Nikon camera and suggested I take painting classes at Guild Hall,” she said of her now ex-husband. A patron of the restaurant, who happens to be a pretty famous artist, also helped her out by telling her what color oil paints to buy, as well materials such as gamsole, a paint thinner and brush cleaner, and of course canvases. Mr. LaBue already had a palette to mix paints, and she was off to the races. She took watercolor classes with Janet Jennings at the original Golden Eagle shop and when the store moved to a smaller location, the class moved to Ms. Jennings’s studio. Ten years later, Ms. Benfield is still taking weekly classes, and now a teacher herself. “Keep pushing through,” she said. “Abstraction is extracting the details.” Like Pollock changed when he used anything but brushes, artists must continue to experiment and push themselves and their work. She first began her studies learning to paint trees, waves and the natural environment. Then she began to look at other artists. “Cezanne inspired most of the early impressionists,” she said. When pressed to reveal her favorite artist, she is hesitant, claiming that different artists influence her work at different times. “[J.M.W.] Turner is one of the artists I like to look at because of the watercolor,” she finally admitted. Always a plein air artist, she is currently experimenting with monoprinting, inspired in part by the artist V. S. Gaitonde. She grabbed one beauty of a sunset that began when she covered a plain square board with gray paint. She placed a piece of paper over it while the paint was still wet, pressed and lifted it up. “I turned it into what I saw,” she said. 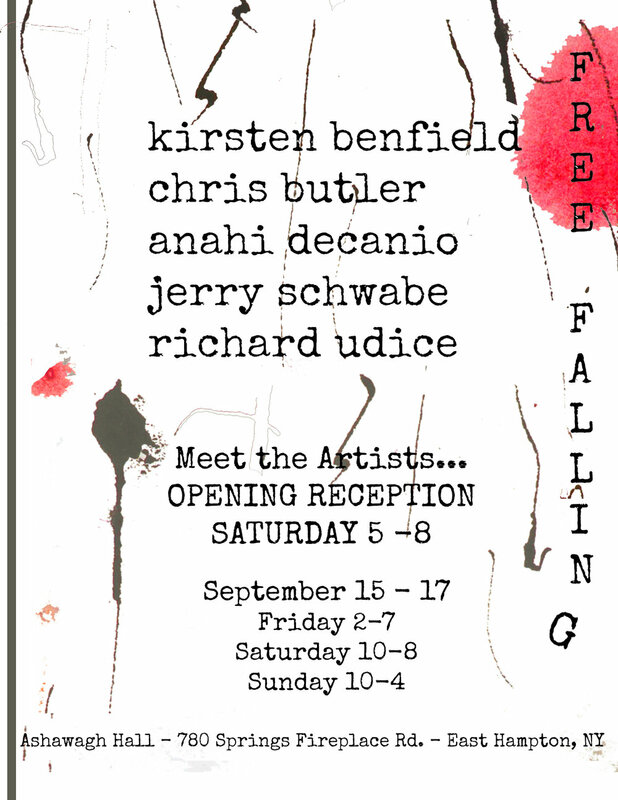 Kirsten Benfield will be in the exhibition “Free Falling” at Ashawagh Hall, Friday through Sunday with a reception on Saturday, September 16, from 5 to 8 p.m.